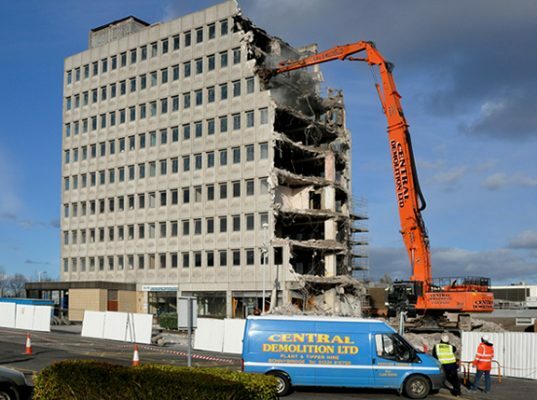 Central Demolition Limited were awarded the contract for the demolition of Franborough House, an existing 8 storey office building situated along Bothwell Street, within the bustling city centre of Glasgow. 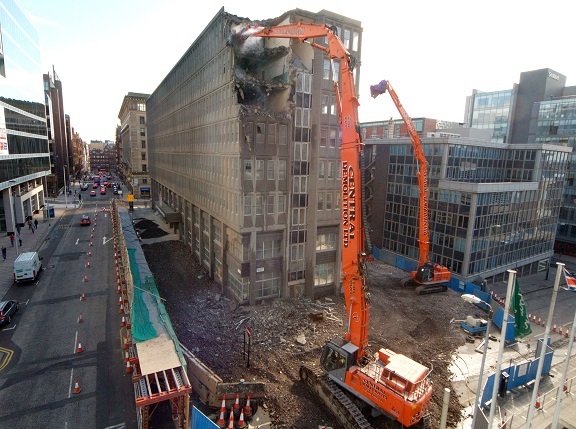 The surrounding streets form part of a busy city centre network, and so we carefully scheduled the arrival and departures of machines and vehicles from the site to minimise disruption to busy surrounding traffic. All services were isolated prior to our commencement on site. When we arrived on site, we established the site boundaries and Heras fencing was constructed around the site perimeter, with safety and warning signs affixed. Our welfare facilities were also brought onto site and set up. When our operatives arrived on-site, they were fully inducted and allocated their specific tasks. 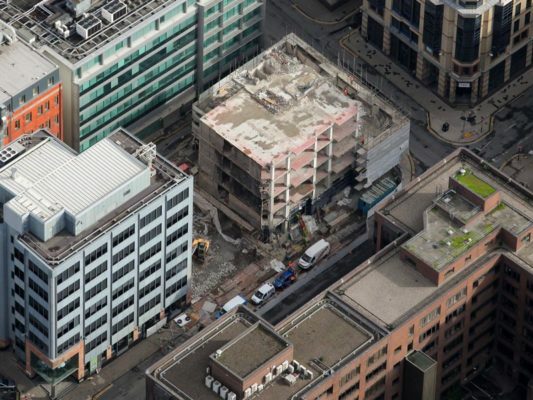 This was a particularly challenging project, as the prime city centre location of the site meant that it was in very close proximity to pedestrian walkways, main roads, neighbouring buildings, an office car park etc. In-depth methods were devised, risk assessments carried out and plans constructed – including for health & safety, emergency procedures and traffic management. We also carried out a dilapidation survey of all surrounding footpaths and roadways. 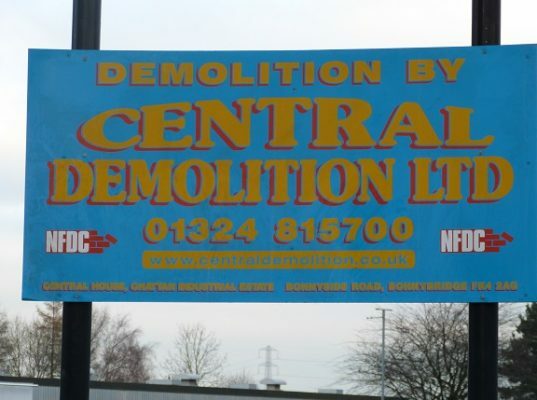 The works involved asbestos removal. Notifiable Asbestos Insulating Board (AIB) was removed from within the toilets on all floors. There were also asbestos cement flue pipes throughout to be removed. Other asbestos operations included the removal of non-notifiable asbestos containing materials such as floor tiles. 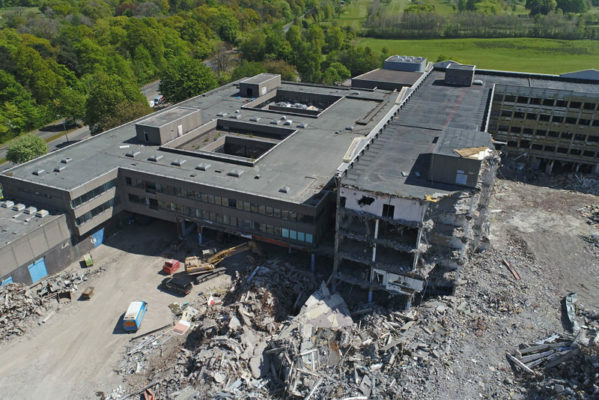 Though there was not a mass amount of asbestos within the building, the asbestos containing materials were spread across a large area. Prior to demolition, a soft strip operation got underway. 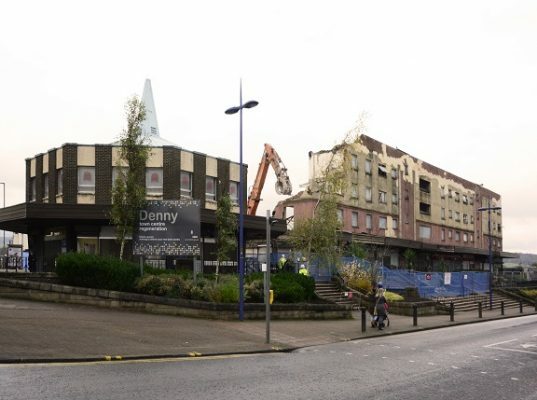 All non-structural fittings, finishings, partitions, doors, service installations, carpets, and timber were removed from all floors. To facilitate the soft strip of higher levels, PASMA operatives erected an alloy scaffold tower. A debris waste chute was installed to avoid conflict with the welfare compound and asbestos de-contamination unit. Skips were used to store and transport waste from site. We were unable to fully or partially close any roads and so we used hoarding with a crash deck, all done in conjunction with Glasgow City Council’s Roads departments. A temporary pedestrian walkway tunnel was constructed, complete with lighting, and as we were working overhead our team had to work methodically, slowly and with extreme care and precision. The tunnel was constructed within 10m of the front of the structure to protect passing pedestrians from any falling debris whilst minimising the disruption caused to them. A safety barrier of reinforced concrete and metal sheets was set up around the perimeter of the building, creating an exclusion zone. The creation of an exclusion zone allowed the surrounding roads to remain open; minimising disruption caused to motorists – especially at peak times. The roads serve up to 10,000 people per day, so these traffic management plans did help to significantly reduce the inconvenience which our works could have potentially caused. 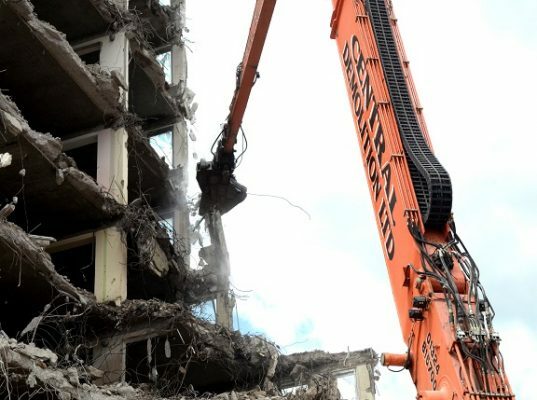 A variety of demolition machines were used to demolish the structure including 360 degree excavators and a high reach machine. Due to the size of the building, we were using several machines at any one time. This required a carefully planned and coordinated approach, to ensure that associated risks were averted. 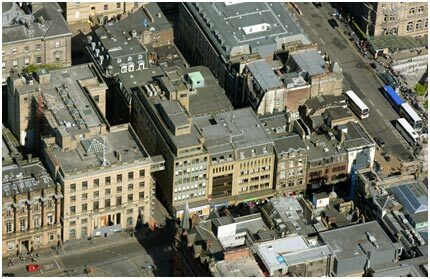 A drop zone was created to ensure that no-one was hit by falling debris and that no damage was caused to surrounding buildings or infrastructure. 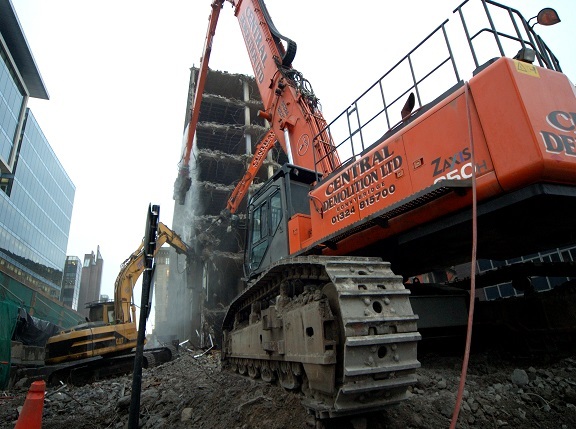 Water was used to supress the dust and fine particles arising from the demolition. 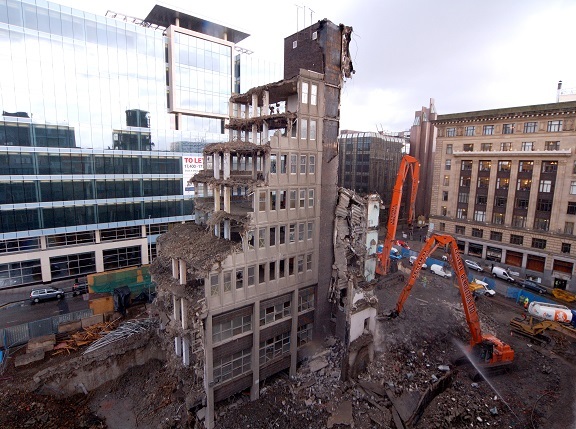 Banksmen were on duty to ensure that no unauthorised personnel were allowed within the area of demolition. Naturally, passers-by wanted to spectate, and though we were happy to let them watch we did ensure that they kept a safe distance and were not at risk at all. 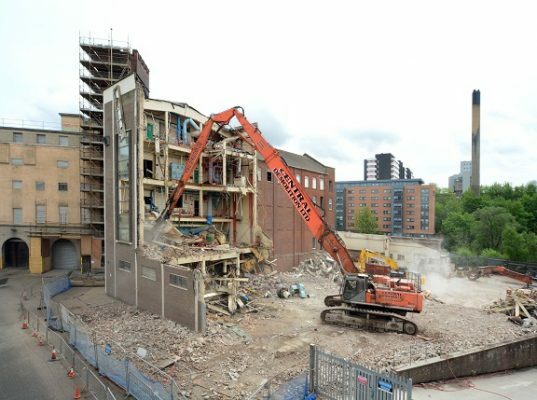 Upon completion of the demolition works, a machine tracked in over the site to leave the site tidy on completion. All demolition arisings were sorted, processed and transferred to our facility at Bonnybridge for recycling. Despite the challenging nature of the project, the contract was very successful and was completed safely, on time and within budget.